Washington State University (WSU) expects students to make satisfactory academic progress toward their degree objectives. Undergraduate students are in good academic standing if both their current WSU semester and cumulative grade point averages are a 2.0 or above. Students not meeting these requirements are considered academically deficient. Notification of academic deficiency will be mailed to the listed address on file, and emailed to the student’s WSU account after final grades have been posted. Additionally, a hold will be placed on the student’s account in myWSU Student Center which will prevent them from registering for classes or making any adjustments to an existing class schedule. To remove the hold students must complete the reinstatement application process. The deadline to complete the application process is the Friday before classes begin. Current students who do not complete the application process by the deadline will be dropped from classes. (a) Undergraduate students whose semester (excluding summer session) or cumulative grade point average drops below a 2.0 for the first time must apply for reinstatement to continue their enrollment at Washington State University. Students are placed on academic probation after reinstatement. Certified majors on academic probation may be decertified by the academic department. (b) First-time, first-year undergraduate students are recessed from the University after their first term of enrollment if their semester grade point average is below 1.0. Individuals are recessed from the university for one full semester (Fall or Spring). To reenroll for courses offered through any WSU campus students must apply for reinstatement. Recessed individuals may not seek status as a non-degree seeking student. Recessed students may enroll in summer session. Former students may seek reinstatement after two semesters by completing the academic reinstatement petition process. Former students petitioning for academic reinstatement must, as part of the reinstatement petition process, provide documentation that demonstrates potential for academic success at WSU. If seeking reinstatement after more than two semesters, former students must also apply for readmission to the university through the Office of Admissions. All academic coursework from other institutions completed during dismissed status must be documented and official transcripts submitted to the Office of Admissions. An undergraduate student who has been reinstated after becoming deficient under Rule 38 or 39 will be on academic probation. The specific conditions of enrollment for students who are on official probation will be determined by the interviewer or Review Board. Students on probation who fail to comply with the conditions of their probationary enrollment will be dismissed from the University. Former WSU students, dismissed under any academic deficiency rule, who have not been enrolled at WSU for four years or more may request at the time that they apply for readmission and reinstatement that all previous WSU work be disregarded. This includes all credits and grade points earned. Once the student is officially enrolled following the first day of the term, the student’s transcript will be marked to indicate that the previous work is not considered as credit earned. After the subsequent completion of 15 semester hours of course work with a cumulative grade point average of 2.0 or higher at WSU, the prior credits earned in courses graded C or better will be restored. Only the courses and credit, not grades or grade points, will be restored. 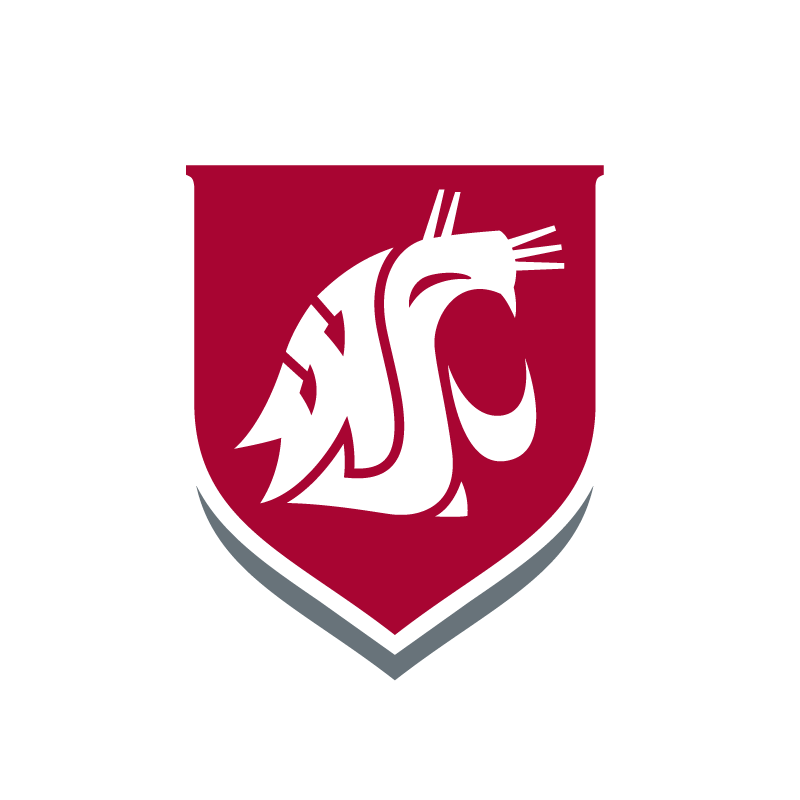 Requests for reinstatement for former WSU students will be considered by the Review Board in the Academic Success and Career Center on the Pullman campus, WSU Online, or designated office on other campuses. Personal statements must be typed. Handwritten statements will not be accepted. Pay Reinstatement Fee in Student Accounts in FLOYD 269. Seminar dates are to TBD. Re-apply for admission to the university. Complete, print and bring with you to the meeting with your advisor. Personal statement must be typed. Handwritten statements will not be accepted. Students are required to satisfy the minimum conditions under the Reinstatement Contract that is created between the student and the academic advisor. Conditions can be modified based upon students’ unique circumstances in order to meet their academic needs. If conditions are not met by the deadline, a conditions hold will be placed on their record in myWSU Student Center. They will be required to meet with their academic advisor and complete the remaining conditions in order to register for classes. If conditions are not met by the end of the term Rule 41 may be enforced at the discretion of the academic advisor. The deadline to satisfy the minimum conditions is by the Friday before the next terms’ registration date. Meet with an academic advisor at least once after mid-term grades are posted. Please check your WSU email regularly as Academic Advising will be contacting your frequently throughout the semester to check on your progress. We will also call you periodically. 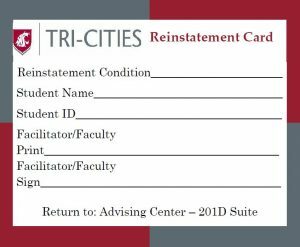 To satisfy your Success Activity, you will be required to submit a Reinstatement Tracking Card to Academic Advising before the conditions deadline. The card should be signed by the facilitator. If you select to do two tutoring or writing center sessions, you will need to obtain two tracking cards. Complete the reinstatement application early! Type the application and personal statement. For best results download PDF Adobe Acrobat Reader. For personal computers, a free version is available at https://get.adobe.com/reader/. Your personal statement is crucial in considering your application for reinstatement to the university. Without a complete and thorough personal statement it will not be possible to give your application complete consideration. Provide specific documentation to support your personal statement. For example, medical documentation of personal or family illness or travel information for unexpected travel. Suggested to attend the earliest seminar available. Especially if you need to register for classes or need to make adjustments to your schedule. This will increase your opportunity to get into the classes you need before they are full. What careers or internships are available in the particular field of study? How can a student stand out in this major? What are some suggestions for succeeding in the field of study? What is the application process for the program/major? What kind of continuing education is important or suggested for careers in the field? What opportunities for research are available for students interested in pursuing graduate degrees? If you are struggling with contacting a faculty member, talk to your academic advisor for suggestions or assistance. The personal statement must be completed by the student applying for reinstatement. It must be typed. Handwritten personal statements will not be accepted. Carefully compose and proofread your personal statement. The quality of your writing, organization, content, spelling, punctuation, and grammar are important in presenting your strongest possible case for reinstatement. Be clear in answering the questions which are provided on the application. Declarations of good intentions are not sufficient. You should provide specific examples of what actions you will take to be successful. Your personal statement should be two to three pages long. For questions about your reinstatement, please contact Karina Aispuro in Academic Advising at tricities.advising@wsu.edu or call 509-372-7035.